Mattresses very comfortable crisp white cotton sheets. 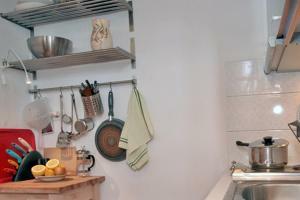 Kitchen well equipped with every thing you need for self catering. Clean beach one of the best on island. Stand Up Boards canoeing for your use was a nice touch. We had the one bedroom and my son and daughter in law had the studio downstairs. Very well designed apartments. With wonderful views from balconies. There was homemade jam and olive oil made from the garden. The property has olive and fruit trees. Wonderful herbs. The hosts can't do enough for you nothing was too much trouble. It's a dream house! Everything was perfect. The house is incredibly nice and has everything you would possibly need. We had one of the studios with a private balcony and a shared terrace. 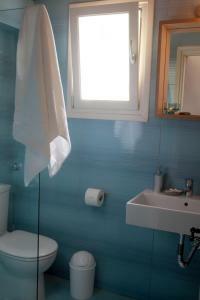 The view is amazing, even the bathroom window has a sea view. It's just next to the beach in a quiet location, but close enough to the nearby village where you can go for dinner or to a supermarket. Joana, our host, was also very welcoming. There are kayaks and stand-up paddling boards that you can use free of charge. Would absolutely love to come back here! A wonderful room with magnificent view in a quite area of the island. The minimal decoration was excellent!! Clean rooms, linens and towels. A big advantage were the free kayaks. Finally the two hostess Ioanna and Katerina were sooo kind and helpful, a real bliss! Great location - very near Steni Vala (we walked to dinner); private area though - lovely and quiet. completely picturesque. Able to use kayaks, SUPs, dry boards and life jackets at absolutely no extra cost. Room was spotlessly clean and had everything we needed. Very warm and welcoming hosts, very helpful. We had a most wonderful stay at Casa Kalypso, with olive oil, homemade jam and soap waiting for us on arrival. Top location, quiet and remote, with a wonderful terrace in front of the studios and Glyfa beach with crystal clear water right next to it. If you want to see more of the island and come off high season, you should rent a car, otherwise just stay and relax. The house is a gem and has got everything, from fully equipped kitchen to kajaks, sun beds, umbrellas, beach chairs, SUPs for use. The whole estate is beautiful, decorated with taste and super clean. We slept like babies. Maria, Katerina, Joanna and Eleni didn’t make us miss anything. Thank you all. Hope to come again! We spent a wonderful week at Casa Calypso. The apartment, though not that spacious, was very efficiently furnished and tidy. Its location is absolutely gorgeous. From the common terrace we enjoyed fantastic sunsets over Peristera. A small pebble beach is at five minutes walking distance and most suitable for an early-morning swim before breakfast. Restaurants and a supermarket are also close by (a 10-minute walk). We very much appreciated the warm welcome and attendance of our host and gladly recommend the Casa Calypso. Beach front property, good access to the village via the beach which is partially lit by street lights. Good panoramic, quiet and relaxing, no children doing what children usually do. From the moment I arrived, I felt at home, with family. The property itself is a bit of paradise, with amazing sea views and a lovely garden. My studio was immaculate: crisp cotton sheets and everything I needed provided with a lovingly applied attention to detail by Mrs. Eleni and her daughter Ioanna. I hope to return next year and many years after. My new happy place. This is a perfect ten. The room was traditionally decorated. 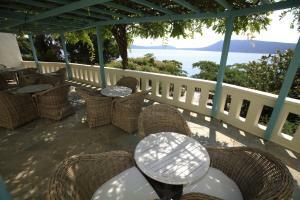 It offers wonderful sea views from the terrace. 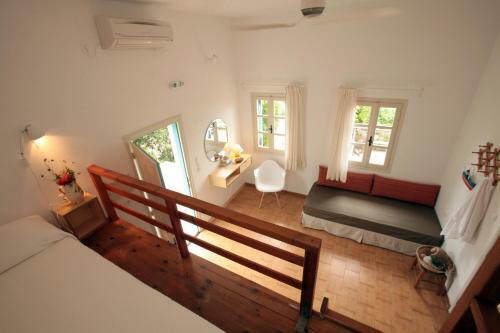 Casa calypso is in a tranquil setting near the sea. The beach is just 5 min walking. This is a cozy family business. Ioanna, the owner, is super helpful and very professional. Steni Vala (the nearby fisherman village just 10 min walking from casa calypso), has the best restaurants in the island. Do not miss the sunrise. Lock in a great price for Casa Kalypso – rated 9.7 by recent guests! Just 100 feet from Glyfa Beach, Casa Kalypso offers a garden with BBQ facilities. 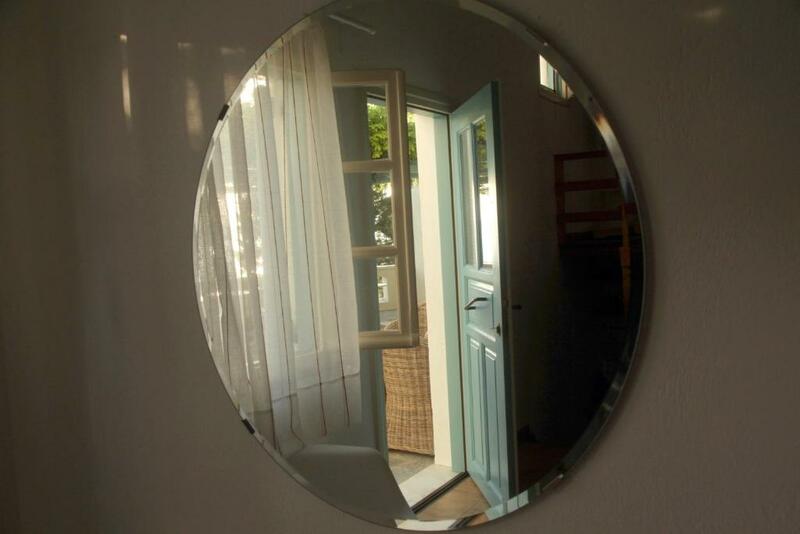 It features self-catering accommodations with Aegean Sea, garden and mountain views. The center of Steni Vala Village is 0.9 mi away. Fitted with an attic and parquet floor, all tastefully decorated and air-conditioned studios of Kalypso open to a furnished terrace. It has a seating area with sofa and a kitchenette with cooking hobs. Guests may enjoy the sea views while relaxing at the sun terrace, or use the BBQ facilities. A garden with trees is available. A supermarket for the general supplies, a restaurant and a café bar can be found 1,000 feet away. Patitiri Port is at a distance of 5 mi. Free private parking is possible on site. 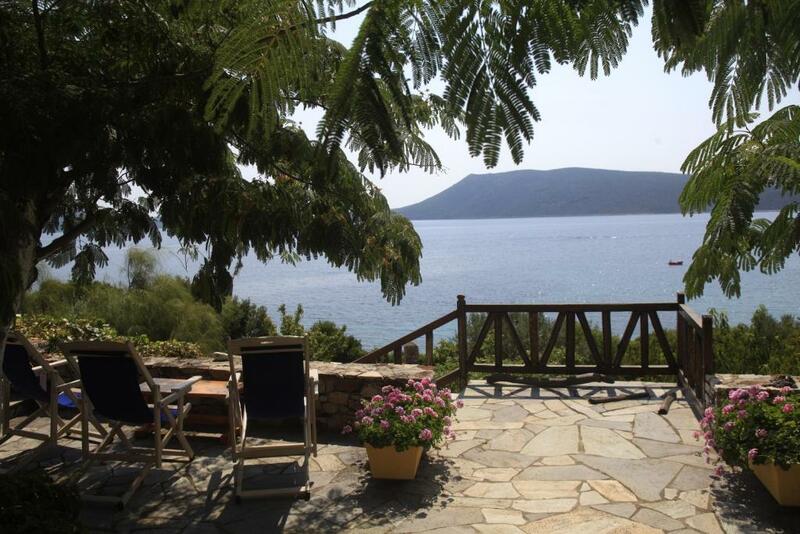 This property also has one of the top-rated locations in Steni Vala Alonissos! Guests are happier about it compared to other properties in the area. 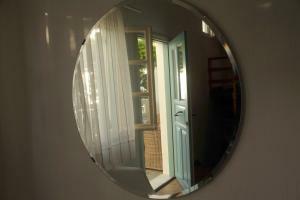 This property is also rated for the best value in Steni Vala Alonissos! Guests are getting more for their money when compared to other properties in this city. When would you like to stay at Casa Kalypso? 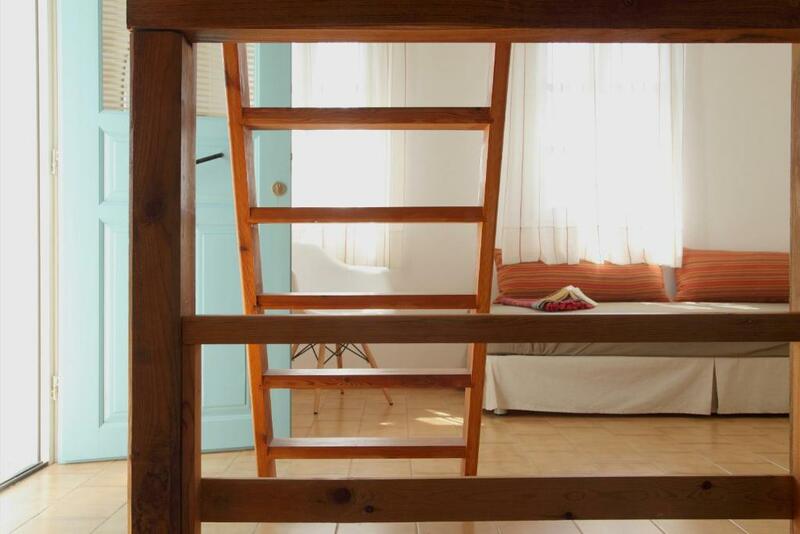 Fitted with an attic and parquet floor, this tastefully decorated and air-conditioned studio opens to a shared furnished terrace with Aegean Sea, garden and mountain views. It has a seating area with sofa and a kitchenette with cooking hobs. Kindly note that this room type accommodates two people. This apartment has a kitchenware, sea view and tile/marble floor. Located on the upper floor, this one-bedroom apartment opens to a balcony overlooking the Aegean Sea. It has an open-plan kitchen with seating and dining area. This villa features a tile/marble floor and a sofa. This suite features a private entrance, kitchenware and electric kettle. This suite features air conditioning, seating area and stovetop. 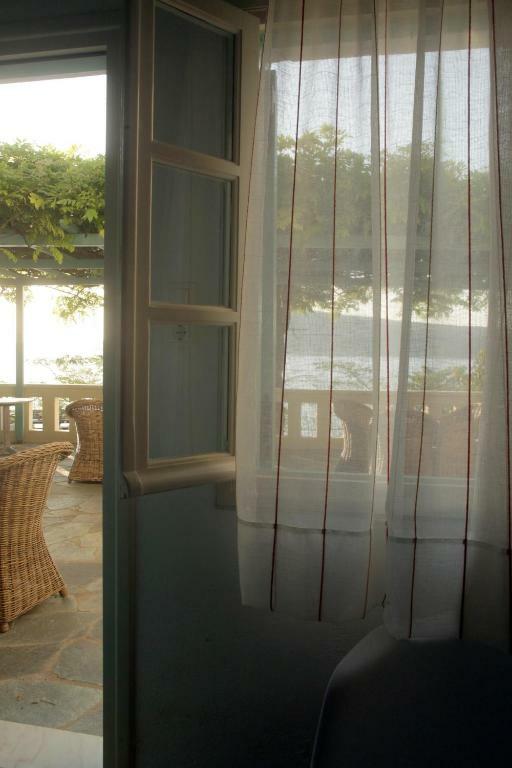 Built in a private sea front property surrounded by flowers and trees, Casa Kalypso is a self-catering establishment consisting of 5 studios, 2 apartments, 2 suites, and a villa. Due to the slightly slanted land all lodgings enjoy excellent sea views. A small footpath leads to a choice of two beaches, which surround the property on both sides. A small jetty in front of the property provides boat owners a safe place to dock their boats. Mini markets, restaurants and cafes are within a short walking distance along the beach. We are Joanna and Katerina Papadopoulou, sisters and owners of Casa Kalypso. Casa Kalypso was built in 1989 by our parents. In 2012, we took over the family business, renovated the main guesthouse and added two suites and the villa incorporating local architectural features in the design and environment friendly practices. Being our childhood summer house, Casa Kalypso is full of memories of carefree moments on the beach below and endless play under the olive trees. It is our ideal place to relax with our families and friends. This is how we’d like our guests to feel when they spend their holiday with us, and that is why we are here to help you discover all the island has to offer and to provide our assistance when needed. Casa Kalypso is located 300 meters north of Steni Vala, on the beach of Glyfa. Steni Vala is a small fisherman village located in the northeast, approximately 10km from the port, Patitiri. While small, the village has tavernas serving fresh fish and local specialties, coffee shops, mini markets and a scuba diving school. Transportation to and from the port is provided by a local bus on a daily basis; taxis are also available. House Rules Casa Kalypso takes special requests – add in the next step! Please note that free WiFi is available on the property's sun terrace. Please note that the studios accommodate two adults. All good. The main balcony is shared for the studio rooms - so just be aware of that. Limited kitchen facilities, no oven, micro wave or toaster, Our studio had three levels, the bedroom at the top had a narrow ladder to the living room, care had to be taken coming down. and the kitchen and bathroom were on the lower floor. Location, confort and kindness of the owner. If staying with 4 people be aware that n the 1BR apartment, there is only one small air conditioner in the bedroom. The main room (lounge/kitchen) can get very warm, especially if there is no breeze. The kids found it hard to sleep some nights because of the heat. Katerina was very kind and gave us a small extra fan which helped a bit. She also mentioned that they were planning to install ceiling fans. Lovely host, beautiful location right on a nice beach. A short walk into Steni Vala for tavernas and small supermarkets. Free use if stand up paddle boards and kayaks. Nice apartment with beautiful views.